Read an article in a recent New Yorker magazine on traffic of Moscow:”Stuck“. It reminded me of Beijing. The similarity amazes me. How both countries, after their corresponding rigid communist central planning years, their capital both decided to abandon all concepts of urban planning and embrace “market” when it comes to car and road. Yet, results of the before and after seem to have some similarities too. We’ve been here before. The cars standing in endless lines on the crowded Moscow streets: they resemble nothing so much as the people who used to wait in endless lines outside the Moscow stores for Polish coats, Czech shoes, and, famously, toilet paper. Now, more comfortably, they wait for the light. They are willing to endure all manner of humiliation to keep driving. The weekend started off nicely with a gorgeous sunny day in San Fran on Saturday (what a rarity in summer!) when Alice arrived. I finally made it out of the house and visited the Farmer’s Market on Alemany Saturday morning. How wonderful it was to be finally out and about. Noah happened to born into the most gloomy month of the City – July. We were lucky to be treated to a couple of sunny ones when he was discharged from the hospital. But ever since, we have been mostly sitting in the glooms. But since autumn just started yesterday, we seem to have entered the real warm month of the city. Hoping to see more sunshine as well. fingers crossed. Suddenly I’m following three TV series: Mad Men, Rubicon, and Sherlock by BBC. Mad Men season four has been a huge disappointment to me so far. I think i finally figured out why. There hasn’t been enough advertising cases in the show! There used to be at least one advertising case study in each episode, and turned out that’s one of the major reason drew me to the show. Rubicon is a bit slow after the more engaging/thrilling first episode, but I’m giving it some benefit of doubt and hoping it will get more interesting soon. The New Sherlock from BBC, where Sherlock Holmes and John Watson were placed in today’s London has been spectacular! Episode one especially, episode three was wonderful too. episode two is a bore. 🙁 I guess the script writer really matters for a TV show, like the director to a movie. I’ve heard so many great reviews of Inception, the movie, that I came to the theatre with high expectations. It is intricately built. It is clever. But it is soulless. There is nothing human about the story, nothing connects me with the characters. It is a show, in which i have no part of. I feel sympathy for no one in the movie. I couldn’t care less whether any of them made it out of their self-built maze. 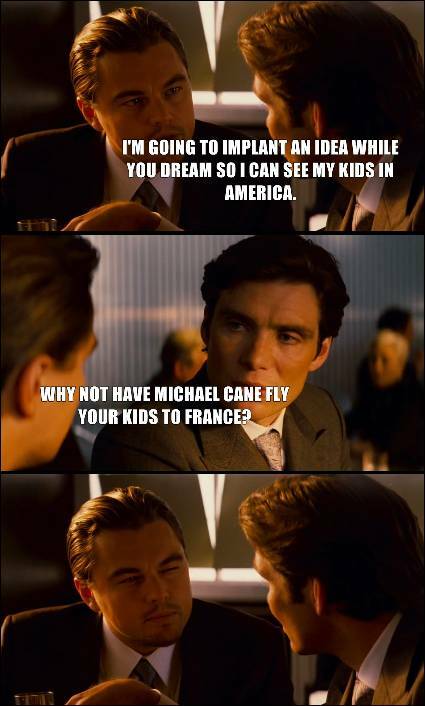 Many has compared Inception to the Matrix. I try to remember why i enjoyed the Matrix so much. ZM thinks it is because the Matrix has simplicity, audience could actually enjoy the entertainment. Inception is too exhausting, and at the end, all that mental effort produces very little reward. What’s the point of it all? Loved this “counter-inception” via Twitter today.